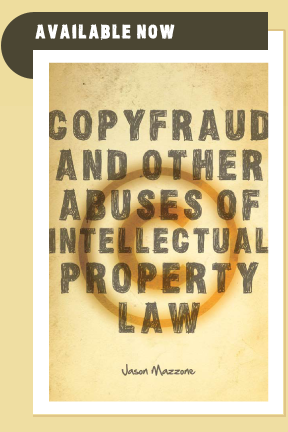 Copyfraud and Other Abuses of Intellectual Property Law is a path-breaking book that will change the way we think about making—and using—music, movies, art, fiction and every other kind of creative work in the twenty-first century. Jason Mazzone argues that intellectual property law in the United States is on the verge of breakdown and needs to be reformed—but not for the reasons given by most critics. Most Americans are familiar with the problems of illicit downloading and stolen software. This is only part of the story. An equally great problem is overreaching by publishers, producers, artists and others who claim stronger rights than the law actually gives them. From phony copyright notices attached to the U.S. Constitution, to lawsuits attacking people who poke fun at Barbie, to costly fights over digital sampling in hip-hop, overreaching claims of intellectual property rights are everywhere. Overreaching interferes with legitimate uses and reproduction of a wide variety of works, imposes enormous social and economic costs, and stifles creative endeavors, in areas ranging from documentary filmmaking to university education to fan fiction. Jason Mazzone, a renowned legal scholar and intellectual property expert, makes a series of timely proposals by which governments, organizations and ordinary people can stand up to creators and content providers who try to grab more than the law gives them. Erudite, surprising and compulsively readable, Copyfraud and Other Abuses of Intellectual Property Law is a breakthrough title that will change forever how we look at creativity, law and commerce. A must read for anyone who cares about the future of creativity.